Rustic Dark Blue Cast Iron Seahorse Trivet 6"
Cast Iron Mermaid Key Hook 6"
Antique Bronze Cast Iron Sea Turtle Towel Holder 7"
Antique Bronze Cast Iron Palm Tree Toilet Paper Holder 10"
Chrome Mermaid Napkin Ring 2"
Rustic Silver Cast Iron Mermaid Key Hook 6"
Seaworn Blue Cast Iron Anchor 17"
Rustic Dark Blue Cast Iron Crab Toilet Paper Holder 10"
This Seaworn Blue Cast Iron Turtle Paperweight 5" is a great addition to any desktop. 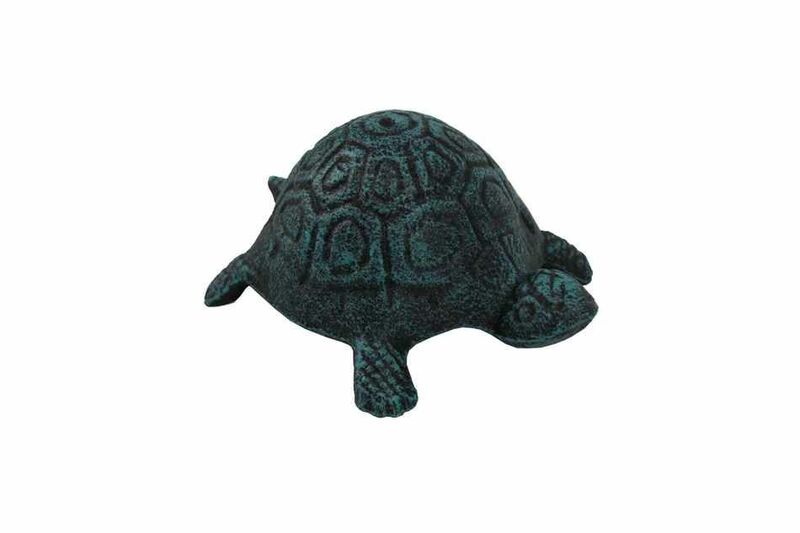 Handcrafted from solid cast iron, this reliable, rustic paperweight securely holds down any paperwork or looks great as a piece of home or office nautical décor. Display this decorative paperweight to add a nautical theme to any room and show those who visit your home your affinity for the sea-faring lifestyle.